Lee Webster is a partner in Osler, Hoskin & Harcourt LLP’s national IP department. Mr Webster’s practice encompasses a full range of IP services, including counselling, acquisition, clearance and infringement opinions, enforcement, commercial and litigation support and IP portfolio strategies. He has deep expertise in structuring comprehensive technology and IP licensing, joint venture, R&D and other related commercial arrangements involving the development and commercialisation of IP-intensive technology and assets. He also has extensive experience with domestic and foreign filing and prosecution, the commercialisation of intellectual property and IP rights enforcement. 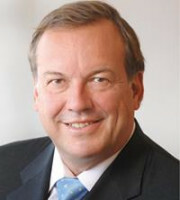 Mr Webster is a founding member of the Canadian Intellectual Property Council and is chair of the Intellectual Property Committee of the Canadian Chamber of Commerce. Mr Webster has been recognised internationally as a leading lawyer in intellectual property, including in The Best Lawyers in Canada 2017 (IP law), the IAM Patent 1000 2017 and the WTR 1000 2018 (trademark prosecution and strategy, gold band). Mr Webster has acted on behalf of many Canadian, US and international clients on strategic licensing matters. Recent notable matters include structuring a technology sharing arrangement for the development and commercialisation of a novel oncolytic virus; advising on licensing and distribution arrangements for medical devices; advising on technology and IP arrangements for the refurbishment of nuclear reactors; structuring and advising on hardware and software-intensive business management systems; acting on behalf of a consortium of major oil production companies in structuring and implementing a technology sharing arrangement for sharing oil sands technology; structuring technology licensing and related patent matters for a natural gas transmission consortium; and advising a New York-based investment bank on IP matters relating to the acquisition of a prominent Canadian patent aggregator in, among other things, mobile phone technology. Mr Webster is a registered patent agent and a registered trademark agent, and has written and spoken extensively on intellectual property and related issues.